Looking for the perfect centerpieces for an 80th birthday party? 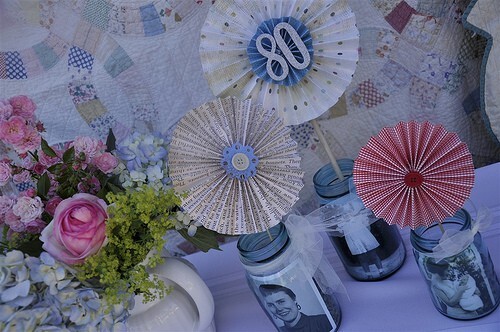 Get inspired by our collection of 80th birthday centerpieces – both DIY and ones you can buy. Here’s a great DIY centerpiece that’s ideal for a golf lover’s party! 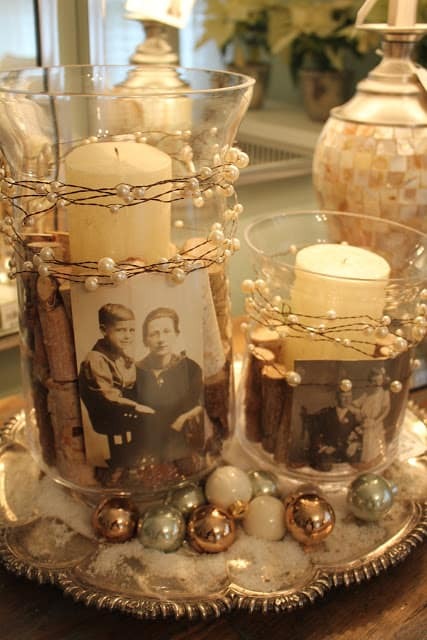 It’s a great way to incorporate photos from throughout the years into a gold theme – and you can make it yourself. Eldarose over at Re-invented Style put together a fabulous golf-themed party for her Dad…if you’re planning a party for a gold lover, definitely check out her ideas. Planning a birthday party for the fashionista? 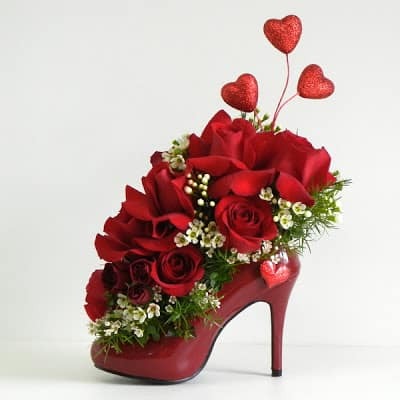 This adorable floral arrangement in a high heeled shoe is the perfect centerpiece! Unfortunately, there aren’t any directions, but you (or your local florist) could probably figure this one out. 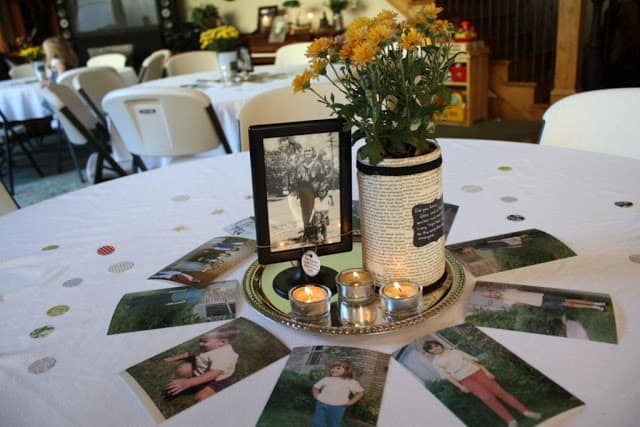 This easy DIY centerpiece is affordable, looks great – and combines pictures with interesting tidbits about the honoree’s life! 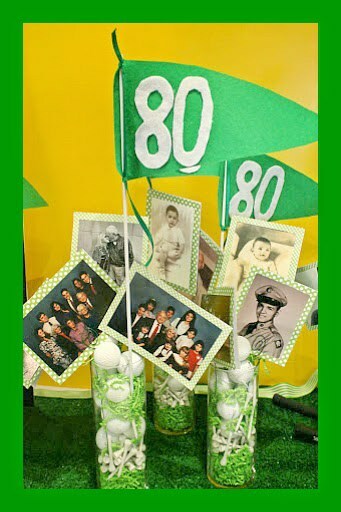 Tomi shares some very creative 80th birthday decorating ideas – including a sign-in table and a wall of photos on her blog. Here’s another easy way to add color and excitement to your tables – with no work! 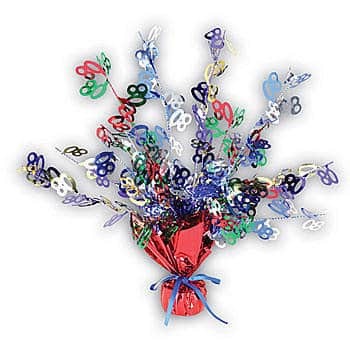 This bright and cheerful centerpiece is available from Amazon. They also offer matching plates, invitations, banners and danglers….perfect if you’re looking for a one-stop shopping experience! Yet another mason jar centerpiece! But this one is dressed up with colorful pinwheels for a little extra pop. Check out the tutorial – and see more party ideas – at Your Home Based Mom. 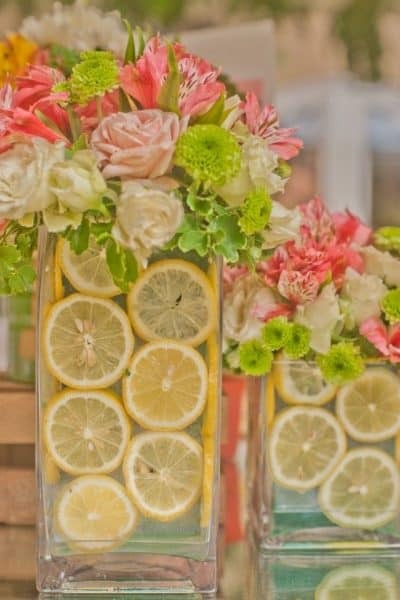 Add extra pop to your favorite flower arrangement by putting lemon, orange or lime slices inside a clear vase. 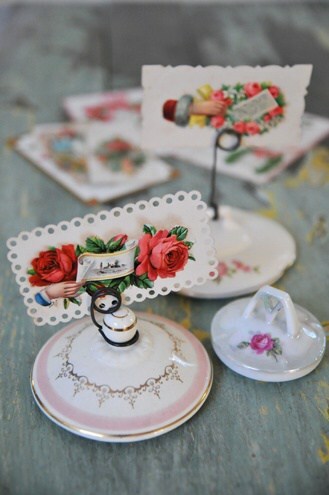 These charming tea-cup centerpieces add a touch of old-fashioned style to a ladies’ birthday party. Although they just used to tops of the tea pots here, I think these would look fabulous if you used the whole teapot. You could also use photos for the decorations (these are really name tags)…and I would use white wire that blends in just a bit better. Looking for an easy – and inexpensive – way to add a pop of color to the party? Order these colorful 15″ centerpieces from Amazon. Priced at under $4 each, they’re a great accent for any party. Add a balloon for extra drama, or use the centerpiece as is. 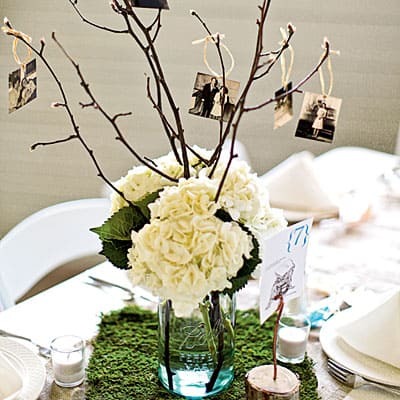 This clever design features pictures from throughout the guest of honor’s life dangling from tree branches. Although they use mason jars, which are adorable, you could use any type of vase or holder you’d like. 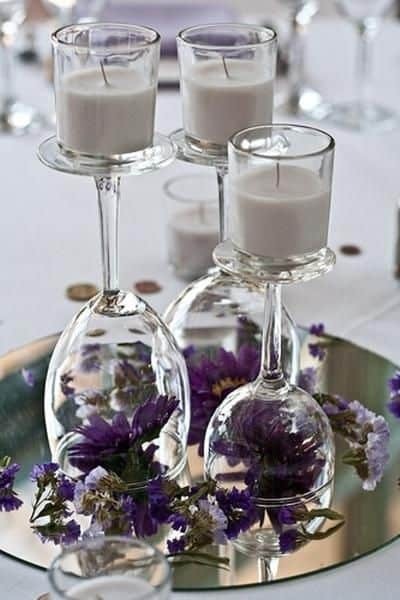 These adorable centerpieces are actually from a graduation party, but they’re a great idea for a milestone party as well! 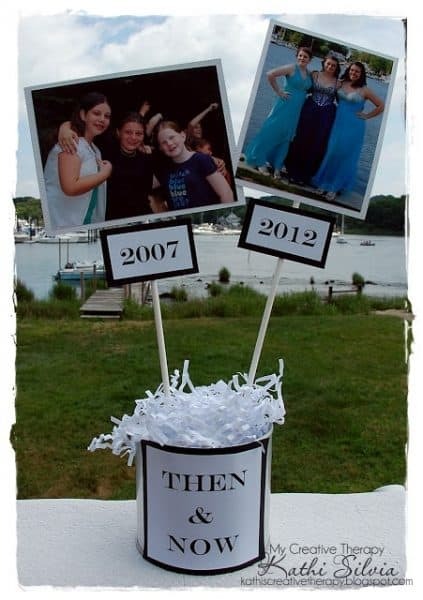 Wedge a block of floral foam into the can, add paper shreds to match your party colors, and add photos on skewers. 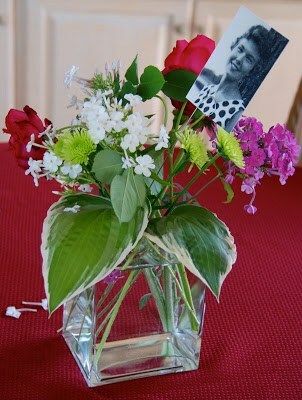 Be sure to check out the rest of the centerpiece ideas – there are several that would work well for an 80th birthday! You really don’t have to work hard to make lovely centerpieces. 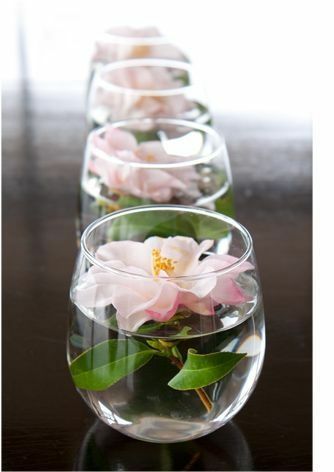 Just float individual blooms of your favorite flowers in glass cups to create a stylish table decoration. This cheerful design features flowers from the blogger’s own garden – they’re affordable and add a personal touch! She also gives detailed instructions on how to add the pictures to the centerpieces. While you’re there, check out the cute photo banner and cupcake decorations! The old-world charm of this gorgeous centerpiece adds a touch of elegance to any party. You could easily change the colors by using different colors of ornaments. There aren’t any directions on the site, unfortunately, but it looks fairly easy to do. If you’re feeling industrious and creative, you could do like this blogger and design a different table centerpiece for each decade of the celebrant’s life! 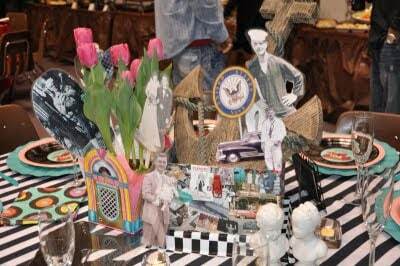 This is the 50’s table, and features both purchased decorations as well as pictures of the guest of honor and his family from that decade. It’s amazing how elegant something so simple can look – and you probably have most of the materials you would need at home! 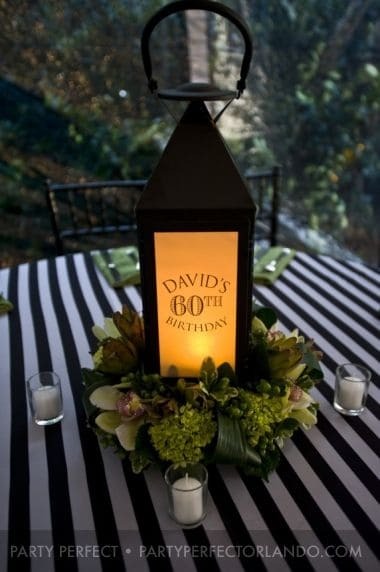 This handsome lantern centerpiece adds a stylish masculine touch to a guy’s 80th birthday. Click through to see the different sides of the lantern – the other sides feature pictures of the guest of honor. There aren’t any directions on how to make the lanterns, but check out the this tutorial for some ideas.